What is left to be said about Richard Nixon? The rise and fall of our most fascinatingly flawed president has been chronicled in countless movies, television shows, and books. He’s been the subject of operas and biopics, pop ditties and poems, naughty satirical comedies and one-man shows like Secret Honor, which Robert Altman adapted for the screen with Philip Baker Hall in the title role. 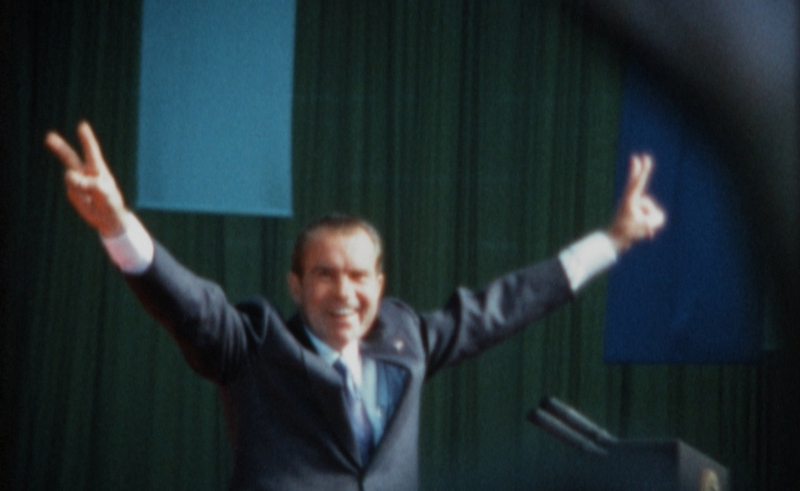 The archival documentary Our Nixon attempts to attack its exhaustively documented subject from a fresh new angle by centering on home movies shot by Nixon’s aides John Ehrlichman, H.R. Haldeman, and Dwight Chapin, which were seized by the FBI as part of the Watergate investigation. But audiences hoping for revelatory, intimate footage of Nixon making pancakes for his family in a dirty undershirt while cheerfully singing Buck Owens songs will be sorely disappointed. They aren’t those kind of home movies. Hell, Nixon doesn’t even appear in many of the excerpts from the hundreds of hours of recordings selectively shown in the film, and much of the footage comes from other sources: television interviews of Haldeman and Ehrlichman sitting down with the high-powered likes of Barbara Walters and Mike Wallace, news reports from the era, and most significantly, audio tapes from throughout Nixon’s time as president. These newly released home movies are the film’s reason for being, but they represent only part of the arsenal of first-time director Penny Lane. Nixon contained multitudes, but by this point, just about every facet of Nixon’s personality and life has been chronicled thoroughly. At best, Our Nixon provides an intriguing reverse-angle view of Nixon’s time in office by presenting him both as a larger-than-life figure of Shakespearean contradictions, and as a supremely weird boss, a creepy dude who thinks long and hard about foreign policy, but also obsesses over keeping Henry Kissinger from being seated next to hot women during state functions, because the diplomat’s propensity for swinging might work in Hollywood, but not in D.C.
Our Nixon follows Nixon’s presidency in roughly chronological order, from the perspective of three relatively young men thrust into the chaos of working for the most powerful, important man in the world. Super-8 cameras in hand, they tried to document the whirlwind into which they were thrust, to capture their brush with history. The film’s most compelling moments capture the president’s humanity. In a particularly riveting sequence, Nixon masterfully delivers his “Silent Majority” speech. Then he calls up an aide and asks what his cabinet members thought of the speech. His voice betrays the neediness of a teenager distraught that a favorite photo didn’t get enough likes on Facebook. The Nixon seen in Our Nixon has incredible power and status, but it never negated his overpowering need for validation. He needs to continually assert his honesty and integrity while on the phone with his advisors, though history remembers him very differently. Our Nixon covers a lot of ground familiar to Nixon devotees, but his quirks, prejudices, and delusions retain their enduring fascination: It’s one thing to read that Nixon stumbled upon an episode of All In The Family and thought it was a movie glorifying homosexuality, it’s another to actually listen to a recording of the exchange. It’s similarly fascinating to witness the over-the-top squareness of a White House performance by the Ray Coniff Singers disrupted by a righteous backup singer using her proximity to the president to publicly denounce the war in Vietnam and praise Daniel Ellsberg. Our Nixon travels a predictably tragic arc as Nixon obsesses over minutiae, and becomes overwhelmed by a rapidly changing cultural and political landscape he can’t understand, much less control. Our Nixon diligently tackles the major milestones of Nixon’s presidency: his election, the Silent Majority speech, his landmark trip to China, his re-election, and ultimately Watergate, but it works best as a portrait of a curious man and his curious times. It isn’t a terribly intimate portrait of Haldeman, Ehrlichman, Chapin, or Nixon, but it is revealing in its own right, as a fascinatingly warped and aged Polaroid of an epic life that’s grown more compelling with the passage of time.